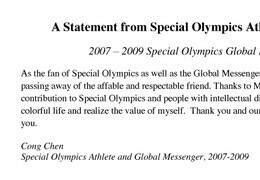 As the fan of Special Olympics as well as the Global Messenger I feel especially sorrowful for passing away of the affable and respectable friend. Thanks to Mr. Sargent Shriver's great contribution to Special Olympics and people with intellectual disabilities, I am able to live a colorful life and realize the value of myself. Thank you and our prayer will always be with you.